Volkswagen's stock crashed 20% Monday, wiping 16 billion euros ($18 billion) off the company's value after it was found to have misled U.S. regulators. Volkswagen, recently crowned the world's biggest carmaker by sales, also owns the Audi and Porsche brands. "The vehicles [with this software] would run 10 to 40 times more emissions than showing in the test," said Andrew Lee, an autos specialist at consultants Frost & Sullivan. Regulators have ordered Volkswagen (VLKAY) to recall the vehicles. The company said it was halting sales of some cars in the U.S.
"This really does cast a negative light on Volkswagen, who are really well known in the industry for having very good mid-segment cars," said Lee. Volkswagen stock hit its lowest level in nearly three years, and pulled down shares in other German automakers such as Daimler (DDAIY) and BMW (BAMXY). 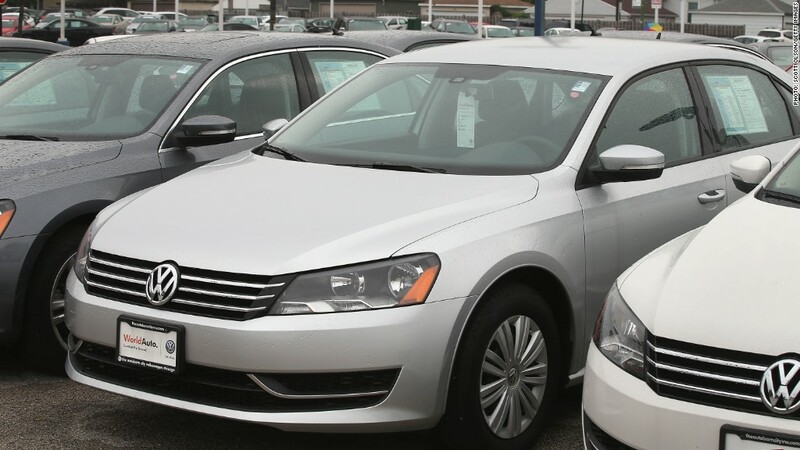 The models affected include the VW Jetta, Beetle and Golf from 2009 through 2015, the Passat from 2014-2015 as well as the Audi A3, model years 2009-2015. Owners of the "CleanDiesel" automobiles have filed a class action lawsuit against Volkswagen. "At this stage it's only in the U.S., we know the tests are different in the U.S. and we also know we have never had any recalls over this issue in the U.K. and Europe," said Volkswagen spokesman Paul Buckett. Authorities in Germany ordered the country's carmakers to come clean on the scale of emissions manipulation. "This is a case of blatant consumer deception and environmental damage," said Jochen Flasbarth, the German government's senior environment official. Volkswagen's recent global growth has not been matched in the U.S., where the group's market share has shrunk to 2% from 3% in 2012, Lee said. Volkswagen has enjoyed a reputation for reliability and quality engineering and that will be damaged by the scandal. The automaker could face fines of up to $18 billion -- or $37,500 for each car that did not comply with legal standards. "No question that this is a big problem for Volkswagen and could lead to CEO Martin Winterkorn losing his job after all," said Christian Stadler, a professor at Warwick Business School. The group's board is meeting on Friday to decide whether to renew Winterkorn's contract until 2018. -- Jackie Wattles contributed to this article.